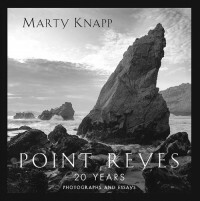 Award winning photographer Marty Knapp celebrates twenty years of photographing the point Reyes Peninsula with the publication of his first book, available in two stunning editions that include many of his most evocative images and intimate essays documenting his journey. Published by Mount Vision Press, this beautiful book faithfully reproduces 43 of Marty Knapp’s photographs on archival paper. The accompanying essays reveal his feeling for the land, the light that illuminates it and his art.